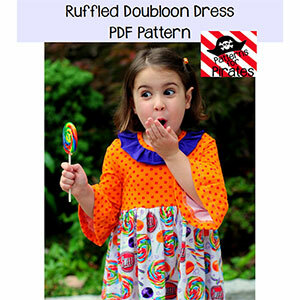 The Ruffled Doubloon Dress is a comfortable knit dress with lots of options. Sleeve options include: mid-length and long sleeve ruffled sleeves. 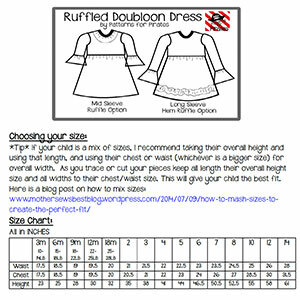 Neck ruffle and hem ruffle options. The skirt can be made with a knit or woven, so you have endless combinations! This pattern comes with sizes 3 months through 14 years. Suggested fabrics are light to medium weight knits such as cotton jersey, cotton lycra or ponte de roma. For the neckband use a rib knit or a knit with good stretch and recovery such as cotton lycra. The skirt and ruffle can be made from and light to mid weight fabric such as cotton jersey, cotton lycra or any of our specialty wovens.